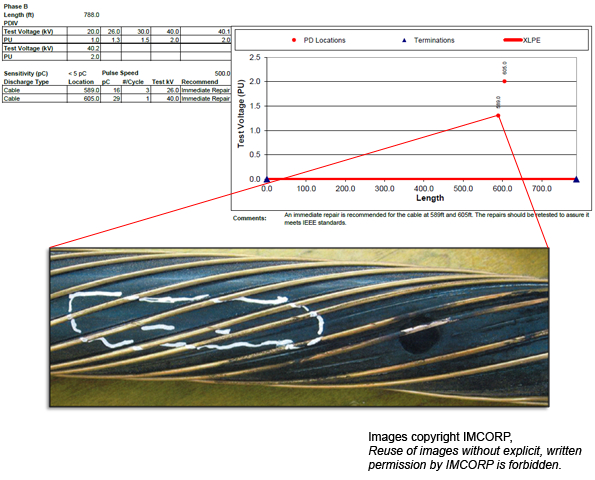 IMCORP's Factory Grade® assessment indicated a PD site in an underground medium voltage power cable. Initial inspection of the PD site did not show any evidence of an issue. According to the latest study no visual evidence is reported in nearly 20% of cases during the field investigation of substandard cable performance. The substandard PD site location was sent to the cable manufacturer to conduct a root cause analysis. Since the manufacturer did not have defect location capability, they performed a simple voltage withstand test to force the defect to fail. Once the cable failed, the manufacturer removed the jacket and found a damaged section of the cable's outer semicon layer. Upon this discovery, they referenced the relevant manufacturing records. The concentric neutral wires were severed during fabrication. To repair the wires, the cable jacket was removed and semicon layer was inadvertently nicked. This defect was not detected before the cable shipped because the QC partial discharge test was never repeated after the repair; so, the cable shipped defective. The white markings in the picture below points out the cut in the semicon layer. The dashed line draws attention to the cut itself. Note, IMCORP's Factory Grade® assessment detected PD activity before the fault in the cable which is a result of manufacturer's laboratory destructive voltage breakdown test.